Toenail fungal infections are very common and are caused by microscopic organisms called fungi. Found most often in dark, warm and moist environments, fungi can enter through tiny cuts or separations between your nail and the nail bed. Once the infection begins, you may notice a small white or yellow spot on your nail. As the nail fungus spreads, your nail(s) may become discolored, thick and even develop crumbling edges. The same fungus that can turn your nails yellow can also cause Athlete’s foot, which results in red, itchy skin between your toes. How can you treat a toenail fungus problem? Fungal infections can be difficult to treat, as they tend to recur. For this reason, Dallas and Plano, TX foot specialists, Drs. Joel Brook and David Northcutt provide an extensive and complete program for treating fungal problems with feet and toenails. At your visit to our podiatric office, we will thoroughly examine your condition and evaluate the nature of your fungal problem, determine any potential underlying reasons, and start a treatment plan tailored just for you. We are proud of the state-of-the-art treatment we provide, which includes our Q-Clear Laser. This procedure can completely eradicate your toenail fungus problemand have you bearing your toes proudly again in no time. Some patients have a sweat problem that contributes to their fungal infection and we have treatment for that as well. Our treatment program includes the laser therapy, nail softening and removal, topical antifungal solutions and the use of the Vitamin B Biotin. This vitamin allows healthy nails to grow back. Many patients are very concerned about the appearance of their toenails in sandals or open-toed shoes and our KeryFlex treatment can restore your ugly toenails immediately to natural looking nails that last up to three months. 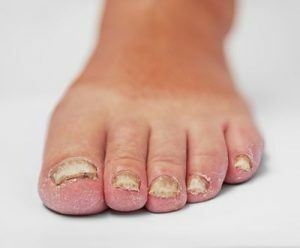 Don’t wait to treat a fungus problem or live with ugly toenails when you don’t have to. Order our free book, “The End of Your Ugly Toenails” today to learn more about this condition. To get started on a fungus program that will bring your feet and toenails back to full health for the summer, call our office today! Make an appointment by calling our podiatric office in Dallas, TX (972) 566-7474 or Plano, TX (972) 943-3323 or schedule an appointment online.